University of Perpetual Help Jonelta System-Binan shocked Nippon Sport Science University of Japan, 83-74, to launch its title campaign in the 10th Asian University Basketball Championship at the PCU gym in Manila. 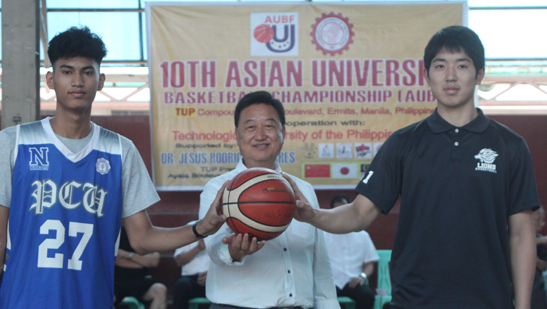 Alvin Tai Lian, FESSAP Chairman of the Board, makes the ceremonial toss opening the 10th Asian University Basketball Championship at the PCU gym in Manila. The Saints relied on John Angelo Rosale and Sean Dillon Laban to pull the rug from under the Japanese in this six-team tournament organized by the Federation of School Sports Association of the Philippines, in cooperation with the State Colleges and Universities Athletic Association and the Basketball Association of the Philippines and supported by the City of Manila, headed by Mayor Joseph Estrada and Manila Sports Council Chairman Philip Cesar. Rosale, a 6’3” forward, scattered 22 points, while Laban added 16 points for the Binan City-based team of owner Dr. Antonio Laperal Tamayo and coach Vic Escudero. “The boys played well even against this highly-rated team from Japan. Ayaw talaga patalo kahit magaling din ang mga kalaban,” said Escudero, whose team topped the Laguna leg of the four-stage competitions in the 1st Philippine University Basketball League-Pacquiao Youth Champs. In other games, Amur State University-Russia defeated Farmco Knight Club of Malaysia, 91-59, and Ningbo University of China overpowered Technological University of the Philippines, 103-62. FESSAP Chairman Alvin Tai Lian, with TUP President Jesus Rodrigo Torres and BAP president Robert Milton Calo, made the ceremonial toss, along with FESSAP State College Affairs Allan Soria, BAP-NCR Commissioner Nestor Macatuno and FESSAP Regional Director Leonardo Andres Sr.
Prof. Robert Milton Calo welcomed the foreign participants during a brief opening ceremony. Games in the prestigious, weeklong competition will now be played at the San Andres Sports Complex in Malate, Manila. Six teams, including four foreign entries, are taking part in the five-day, round-robin competitions hosted by the Philippines. No related stories matched this topic.